There’s nothing more frustrating than a spotty internet connection when you’re trying to get work done or watch a movie. While the problem may lie with your ISP service, often, your DSL modem is to blame. Investing in a new DSL modem can help to speed up your Internet connection, saving you time, money, and frustration in the long run. Read on to learn more about our favorite DSL modems and how they can help to improve your online experience. There are a few basics to cover before we go into our product recommendations. Let’s get started! Digital Subscriber Line, more commonly known as DSL technology, offers a way of transmitting high-speed Internet through phone lines. Unlike its predecessor the dial-up connection, DSL allowed users to receive calls on their home phone while surfing the web, making it a game-changer. In its early days, DSL gained a reputation for having lag issues. This could be a huge inconvenience to everyone from home business owners to gamers. Older ADSL standards were only able to deliver lackluster speeds using unshielded twisted-pair copper wire. Thanks to rapidly evolving advancements, current technology, and decreasing costs of equipment, DSL lines have become faster over the years. The bit rate of typical DSL services can range anywhere between 128 Kbps to 3 Mbps. The speed a consumer may see depends on a number of factors, including line conditions, implementation, maintenance, and DSL technology. Newer DSL technologies (discussed below) can reach speeds much higher and can compete with cable internet service. A modem is a device that lets computer users access the Internet from their desktop. In the earliest days of the Internet, dial-up connections relied on modems that were typically found inside of computers. Nowadays, most people have modems that are a separate piece of hardware. DSL modems are most often standalone units that connect to computers, routers, and telephone lines using cables. A DSL modem, like a 56K dial-up modem, gives you access to the Internet through your home telephone line. It uses a DSL connection, however, allowing you to make calls through your landline even while online. DSL modems also offer faster service, giving you access to your favorite sites much more quickly than with a dial-up connection. When buying a new DSL modem or replacing an old one, you can get a standalone model would would need to purchase a separate router or opt for an all-in-one unit. Modem/router combinations, also referred to as “gateways,” are easy to set up and can help to enhance your home Internet network. Not only do combination modems allow you to connect to your ISP, but they also offer a wireless router function that lets you share your online connection with other computers and mobile devices in your household. You can connect either wirelessly or through Ethernet ports. DSL users may be surprised to find out that there are several different types of DSL broadband connections that computers use to communicate. Businesses typically rely on Symmetric DSL (SDSL), which places equal emphasis on download and upload speeds. Residential properties, on the other hand, most often use Asymmetric DSL (ADSL) services. These focus on download speeds, allowing families to access vast caches of information quickly. Over the years, ADSL services for residential homes have improved in terms of speed. Certain ISPs now offer faster connections of up to 12 Mbps using ADSL2 and up to 2 Mbit/2 with ADSL2+. Very-high-bitrate Digital Subscriber Line service, or VDSL, offers up to five times faster download speeds and up to ten times faster uploads. In fact, maximum upload speeds can reach around 60 Mbits/s for users living close to their service provider. VDSL offers an improved experience by using phone line connections more efficiently than ADSL services. Uni-DSL is a service proposed by Texas Instruments that would combine the best aspects of VDSL and ADSL to bring consumers and even faster broadband solution. Uni-DSL offers the prospect of speeds up to 200 Mbps, far faster than either current ADSL or VDSL options can provide. The speed of your DSL connection depends in part on the modem hardware that you use. Likewise, the Wi-Fi speeds that you experience at home depend on the type of router that you use to connect your various devices to the Internet. Most Wi-Fi connections run on either 2GHz or 5GHz frequencies. 2.4GHz bands can cover a wider area than 5GHz frequencies. While this gives you stronger signals across a broader range, the trade-off is slower data transfer speeds. There are only 11 channels that 2GHz devices to connect to, making it easy to overcrowd the signal and force connection speeds to stagnate. While 5GHz bands can’t reach as far as 2.4GHz bands, they pose less of a risk of overcrowding. There are 23 channels for devices to connect to, preventing channels from dropping or being interrupted. Download speeds also tend to be faster. - Wireless N (802.11N) routers are usually capable of operating at both 2.4GHz and 5GHz. They can transfer data at different rates depending on the number of antennas attached. Speeds can reach a potential rate of 450 Mbps if using three antennas or 300 Mbps if using two antennas, but speeds tend to average around 130 Mbps. - Wireless G (802.11G) routers don’t support as fast of speeds as N devices. These models can only handle transfer rates topping around 5 Mbps and run only on the 2GHz band. G routers are often significantly cheaper than counterparts, however. - Wireless AC (802.11AC) devices are relatively new, only hitting the market around 2013. AC routers can transfer up to 1 Gbps of data on a 5GHz band network or around 450 Mbps on a 2.4GHz band. Can a Better DSL Modem Increase Speeds? The modems that ISP providers offer often provide consumers with only the bare minimum. Rental modems may have suffered from wear-and-tear, or they may be older models that don’t support newer DSL technology. All of this can negatively impact the Internet speeds that you experience at home, especially if you invest in an expensive high-speed package. Replacing an old, worn, or obsolete modem can help to improve your data transfer speeds so that you can get your work done more quickly. It’s best to look for newer modems that support current and future DSL technologies. ADSL2+ and VDSL modems offer some of the fastest speeds for residential Internet users. If replacing a modem fails to improve speeds, the problem could also lie with your router. A router that doesn’t support high-speed connections can create a bottleneck effect, slowing down speeds when you try to access the Internet from a device that’s connected wirelessly to your DSL network. Wireless G offers the slowest rates, so if you’re looking for a quick connection, it’s best to look at N or AC routers. A lot of people only replace their modem when their own is broken. ISP companies often offer free support and replacement services for DSL modems, but it can take weeks to months to get your Internet in working order again. Usually, it's a better idea to invest in your own modem. You can purchase a brand-new unit, and have it hooked up in just hours. Not only will replacing your modem save you time, but it will be cheaper in the long run. You'll save on rental fees and can keep the unit if you ever decide to switch ISP services. Some users don’t wait for their old modem to give out before investing in a newer model. Replacing an old unit or an ISP rental with a brand-new DSL modem can immediately result in faster speeds and a more stable network. If you’re looking to improve your home internet experience, a new DSL modem may be all that it takes. Replacing your modem or installing a new one is a fairly easy task, even for the tech-illiterate. New modems often come with easy-to-follow instructions, or you can look up video tutorials online. If you’re replacing an old modem, you can usually follow its setup as a straightforward template. Once you’re sure that your modem is properly plugged in and installed, you may have to contact your ISP to complete the setup. Some companies need customers to provide them with a new modem’s MAC address to activate or reactivate an Internet connection. The MAC address isn’t difficult to locate--it’s usually printed as a prominently labeled twelve-digit code on the back of a modem unit. Purchasing and setting up your own modem can help to improve your online experience, but it’s important to remember that this may void service contracts with your ISP. Most companies will only provide technical support for customers who use a rental modem. If you have issues with your new modem, you’ll be forced to either fix the problem yourself, purchase a new modem, or start renting from your ISP again. While this can take money out of your own pocket, buying your own modem is still usually a cheaper option than renting. There are plenty of reasons to invest in your own modem instead of renting from an ISP. Not only does a new modem make your connection faster, but it can also improve reliability. Newer devices also tend to last longer than rentals, which suffer a significant amount of wear over the years that can affect performance. It’s a good idea to look for a modem with a durable build, as a good modem should last for at least a solid five years. Even though a new modem may require an initial investment, over the years of its life it will more than pay for itself. Having your own modem means you won’t lose money to your ISP through monthly rental fees. You also won’t have to return your modem to your ISP if you switch services, helping you to save money on future Internet plans. In addition to monthly fees, many rental modems come with limited access to a web-based control interface. This makes it more difficult to monitor or tweak your network when looking to improve speed or performance. By buying your own modem, you’ll have easier access to handy built-in features such as traffic logs and signal quality charts when troubleshooting. You can also experiment with third-party firmware to improve your online connection. Time to jump into our reviews. These will help you make a more informed buying decision when the time is right. Our top choice of DSL Modem is the NETGEAR N600. It’s fast, with a wireless N network that offers speeds of up to 600 Mbps, and it’s durable. It also doesn’t hurt that the device comes in a sleek package. The N600 works with a wide range of ADSL, ADSL2, and ADSL2+ ISPs, including AT&T, Verizon, CenturyLink, and Qwest. This modem/router combo is also able to connect with a variety of devices, including both wireless and wired electronics. It boasts five 10/100/1000 Gigabit Ethernet ports with auto-sensing technology to make it easier to connect multiple devices at once seamlessly. A ReadyShare USB hub makes it easy to connect USB devices to the N600. Friends and family can share media stored on thumb drives and hard drives through their modem. You can also wirelessly print pages and photos from any Mac or PC connected to a USB printer. The NETGEAR Genie can help you to manage your Internet connection and home network, whether you’re a tech expert or a beginner. The genie offers easy dashboard control that allows you to monitor and repair issues with your modem or router. DSL modems come in a range of prices, but one model that gives you some good bang for your buck is the Linksys X1000 N300 modem/router combo. It’s cheaper than many other high-end counterparts while still offering exceptional quality of build and performance. The X1000 supports ADSL2+ standards and older. It works with several big ISPs, including Centurylink, AT&T, and even Telmex in Mexico. Wireless N technology allows the router component of this device to offer transfer speeds of up to 300 Mbps. You can connect to multiple devices and send data more quickly than with a G Wireless router. Three Ethernet ports also let you hook up to an even wider range of devices. Users who are concerned with safety will be happy to know that the X1000 offers advanced wireless security. You can keep your data protected with WPA/WPA2 encryption, an SPI firewall, and secure guest access. Parents can also protect their children from shocking or dangerous content with parental control settings. These days, there aren’t a lot of DSL modems that come without built-in routers. A lot of home Internet users like the convenience of a 2-in-1 setup. For the more tech-savvy, though, a separate setup can offer several benefits. It’s cheaper to upgrade and gives you more control over settings and firmware. A separate router and DSL modem are also easier to position for the best reception. The TP-Link ADSL2+ Modem supports the latest ADSL, ADSL2, and ADSL2+ standards allow you to access a high-speed DSL connection over a wide range of services. The router can provide up to 24 Mbps downstream, offering fast speeds even to customers living farther away from their provider. In addition to a phone line port, this modem has standard Ethernet interface. It can connect with any 10/100 Mbps device, including both older and newer electronics. It’s also easy to hook up this TP-Link modem to a multi-port wireless router to create a home Wi-Fi network. Once you have your modem ready to go, it’s easy to maintain without relying on outside tech support. Convenient LED indicators keep you updated on the modem’s status and activities, letting you know when it needs servicing. You can also access a web-based graphic user interface to modify settings and connect to your ISP. The TP-Link ADSL2+ Modem is not just designed with performance in mind, but also safety. It has a built-in firewall to prevent against hacking and other online attacks. 6KV Lightning Protection helps to prevent electrical damage and shorting during thunderstorms. If you have an AT&T connection, the modem that you use needs to be compatible with your Internet package. The NETGEAR AC1200 works with most AT&T services except for U-Verse, which requires you to use a modem supplied by AT&T. For other DSL plans, though, you can get faster speeds and more stability by swapping from your rental unit to the AC1200. This modem also works with Verizon, Qwest, and CenturyLink. This top-of-the-line modem/router combo supports ADSL2+ and a wireless AC network, giving users speeds up to three times faster than N networks. You can enjoy next-generation Wi-Fi at speeds of 300+867 Mbps. This is ideal for smooth HD streaming and gaming over home devices. AC1200 users can access the NETGEAR ReadyShare cloud through their device, giving them remote access to their USB hard drive. This lets you wirelessly access and share media both inside and outside the home. All Wi-Fi connections are secured using WPA/WPA2 encryption, helping to keep sensitive data such as financial information and medical records out of the hands of cybercriminals. The C1100Z uses VDSL2 standards to offer CenturyLink customers stable connections and incredibly fast speeds. This lets multiple users surf the web, stream video content, play games online, and more without worrying about connections dropping or freezing. A Gigabit Ethernet WAN port can support either a cable connection or act as a Gigabit 5th LAN port to support a DSL connection. This router portion of this port uses wireless N technology with four antennas to provide data rates of up to 300 Mbps. 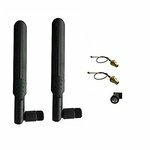 The antennas also help to improve range while eliminating dead zones. Dual Ethernet firewalls, including NAT and SPI, allow the C1100Z to identify and manage threats to security. Users are also protected by WPA2/WPA/WEP encryption to protect devices using Wi-Fi. Setup of the C1100Z is simple. With just the push of a WPS button, you can start using a safe and secure wireless network at home. Once your network is set up, it’s easy to monitor and manage via TR-069. While all of these DSL modems can help to improve your Internet experience, the NETGEAR N600 Dual Band Wi-Fi Modem Router is the clear winner in terms of both price and quality. Not only is it affordable for consumers on a budget, but it also offers speeds of up to 600 Mbps. Instead of using an ISP rental modem, purchasing your own unit can improve your internet connection so that you can enjoy the media that you love without interruption. A DSL modem is a bit of an initial investment, but it can end up saving you money in the long run.